The Caribbean island nation of Antigua and Barbuda has again come full circle in its ongoing World Trade Organization battle against the United States over the free accessibility and marketing of online gambling services. According to a statement filed by the nation’s WTO representative, Antigua will enact a program to collect the judgment due it through the abrogation of intellectual property rights unless the US offers a substantial settlement by the end of 2016. Antigua triumphed against the US in a WTO ruling back in 2007 over the US’s failure to allow online-gambling services to be marketed to US residents. The online market was first included in a relevant WTO trade pact over two decades ago, in 1995, in the “Uruguay Round” of updates to the existing General Agreement on Trade in Services involving the two nations and many others. Antigua sought billions from the WTO arbitrators, but was ultimately rewarded a $21 million abrogation right, allowing the island country to market and sell royalty-free copies of various electronic media produced by US-based companies. Movies, TV shows and music are the likeliest media available for collection of the judgment, should Antigua now go that route as threatened. The threatened move to collect actually returns Antigua to the stance the country maintained shortly after the initial ruling, back in 2007 and 2008, when the country’s previous administration won the WTO judgment with the long-term assistance of Mark Mendel, a then-Houston-based contract lawyer. However, the current administration of PM Gaston Browne fired Mendel in 2014 and tried a softer negotiating tack with the US, only to discover what the previous government already knew: The US had no interest in settling the WTO judgment or even negotiating seriously on the matter. The conflagration up again this month, when the US publicly boasted of its recent victory over China in another WTO case, all while ignoring the ongoing Antigua matter. Over all this time my government has patiently engaged in good faith consultations with the Government of the United States in the genuine hope that the harm done to our economy by US action would be repaired through a settlement that recognizes justice and fairness. Alas, the US has not been able to propose terms for a settlement that would even remotely compensate for the harm that has been done to our economy and continues to impact it negatively. And while the US continues to act in contradiction of the rulings and recommendations stipulated by DSB concerning my country, it remains the most active user of the [WTO]’s Dispute Settlement System. Any authorization pursuant to the award would be strictly limited to Antigua; every other WTO Member remains obliged to protect U.S. IPR under WTO rules, including enforcement against any IPR-infringing goods. Moreover, even with respect to Antigua, it would establish a harmful precedent for a WTO Member to affirmatively authorize what would otherwise be considered acts of piracy, counterfeiting, or other forms of IPR infringement. Furthermore, to do so would undermine Antigua’s claimed intentions of becoming a leader in legitimate electronic commerce, and would severely discourage foreign investment in the Antiguan economy. In other words, the US planned to pressure all other countries’ citizens not to obtain the royalty-free versions of products, should they ever become available, and attempted to make the island a global pariah. The US also supplies economic aid to Antigua, even though the US actual enjoys a billion-dollar-a-year trade surplus with Antigua and Barbuda. The return to post-2007 levels of antipathy in the dispute is perhaps inevitable. 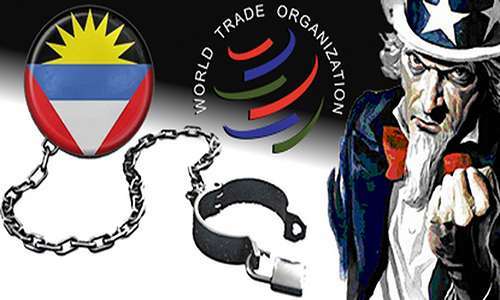 Antigua did step in to stop a private start-up that attempted to do business in 2009 under the umbrella of the 2007 WTO ruling. On July 15th, 2009, a company called ZookZ opened its virtual doors, offering “tens of thousands of music selections and movies” and promising “to add 300 movies and 10,000 songs each week.” The site did not use P2P (peer-to-peer) sharing of files, a distribution method long targeted by US companies seeking to enforce their copyrights. This writer can personally verify that the ZookZ site was operational for several days, until Antiguan authorities forced it offline under heavy pressure from the US. The forced closure was due to the fact that the settlement was owned by the government of Antigua, rather than any of its private citizenry, and the government at that point had not determined if or how it would collect the pending judgment. Nonetheless, a service similar to ZookZ remains the likeliest channel through which Antigua could attempt to collect the more than $250 million it now is owed by the US.